5.Let you connect your DVD, Xbox 360 to your HDMI Display. Interface Type: YPbPr/RGB + R/L Input HDMI Output. It can't reverse. 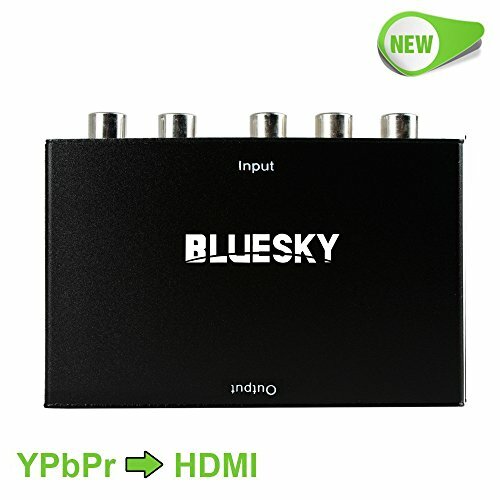 Attention--- This product can only support YPbPr Component to HDMI. Please make sure: 1).Signal is from YPbPr Component to HDMI, 2). the input signal is YPbPr Port, instead of RCA Port( See the picture 2). Video--- This converter enables you to connect your YPbPr old DVD player or game console/Xbox 360 to your new HDMI Display. Support the highest video resolution up to 1080P. The signal source and output source must have the SAME resolution to make this product work. Audio--- Support uncompressed audio such as DTS Digital,Dolby Digital(Including DTS-HD and Dolby True HD). Support PCM stereo. Operation---: Easy installation & operation, no additional software needed. Power supplied by AC adapter directly. Electronic product may occur problem like Compatibility, resolution or format etc, so we hope you can contact us before you leave a negative review when you couldn't use it. We are always here to support you. Warranty--- One Year Warranty and Lifelong Support by Bluesky. If you have any questions about this product by Bluesky, contact us by completing and submitting the form below. If you are looking for a specif part number, please include it with your message.